That short exchange planted the seed for Meier’s next line of business. Five years later, he presides over Oysters XO, a unique catering company that specializes in shucking and serving oysters at events across the country. In conversation, Meier is hyper-animated, and he can talk about any number of topics before settling on one that really interests him. 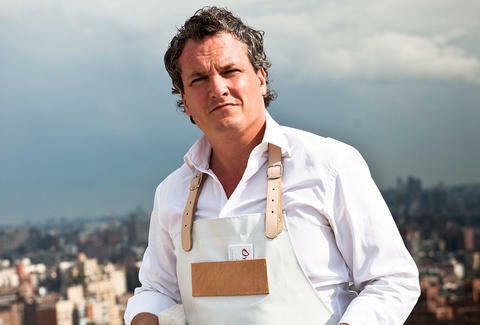 It’s easy to see how he might suddenly jump from selling art to shucking oysters, in turn ending up at some of the swankiest parties in America. All it took was a little know-how -- and some Craigslist ads. After that 2012 oyster excursion with his friend, Meier’s imagination kicked into gear, planning how he might bring this service to the US. 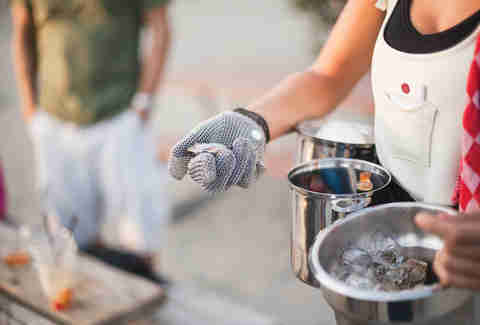 The idea is simple: oyster chefs shucking in front of party guests, armed with only their knives and a belt loaded with oysters and mignonette. They shuck oysters right in front of their customers, providing any information you’d like to know about sourcing, flavor profiles, and tips for enjoying them. It’s not an easy task to shuck and serve on your feet, but that’s why they’re the pros. Ever since that first stroke of inspiration, Meier has been pretty obsessive about oysters. Not only did he set out to learn everything there is to know about them, he developed a new method of shucking to ensure a perfect presentation every time. “Since you’re shucking and serving directly in front of the guests, the product needs to be consistent and clean. That’s why I source all my oysters directly, and also focus on having the perfect shucking technique.” The technique? Well, he’s happy to teach you himself, since he’s beginning to teach shucking and oyster tasting classes at the James Beard House, “Teaching America How to Shuck.” Meier says he’s looking to teach more of these classes, so don’t be surprised if he’s soon bringing his love of oysters to a city near you.